Moore, Cockrell, Goicoechea & Johnson, P.C. 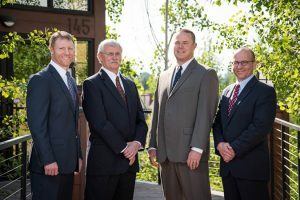 was originally formed in 1996, when the founding partners – Dana Christensen, Mikel Moore and Dale Cockrell – opened the firm in October of that year. The founding partners created the firm with the goal of applying their already-considerable experience to their clients’ increasingly complex legal challenges. From its inception, the firm has provided experienced representation in civil litigation matters and commercial and business transactions. Over the years, the firm’s experience has deepened and its client base has grown. Despite the firm’s small size, its lawyers are often selected to represent clients in high-profile, high-stakes matters. While maintaining its focus on integrity and excellence the firm looks forward to perpetuating its reputation for providing exceptional legal representation.